This site provides information and resources to aid in the distribution and effective use of the Hemingway Measure of Adolescent Connectedness, the first research-based measure of adolescent connectedness. The Hemingway was developed in response to the need for an effective way to evaluate the impact of a high school mentoring program. Adolescents’ level of “connectedness” to family, school, friends, and self has been found to contribute to academic performance but also predict violence and substance use. Fortunately, the school environment directly influences students’ levels of connectedness such that connectedness appears malleable to school-based interventions. This site is intended to serve researchers and educators by making the Hemingway scales, examples of real-world applications, and the underlying research available for download. Connectedness is one of the 5 “C”s Lerner (2000) suggests youth development programs target, in part, because it has been found to predict a number of developmental competencies as well as risks. However, until recently there were no published reports of a measure of adolescent connectedness that had been theoretically derived or empirically tested. Drawing on theories of problem behavior, belonging and attachment, and ecological development, Karcher hypothesized connectedness to reflect an ecologically specific form of engagement with others and the environment. Exploratory and confirmatory factor analyses were conducted to develop a measure of adolescent connectedness, and latent variable modeling was used to test the differential role of conventional and unconventional connectedness in the prediction of substance use (Karcher, 2003). Results suggest that connection to family, school, and friends make unique contributions in explaining adolescent behavior and should be examined separately in future research on connectedness. Karcher's research has examined these constructs cross-culturally (Karcher & Lee, 2002), as outcomes from intervention studies (Karcher, 2005; Karcher, Davis, & Powell, 2002), and as predictors of risk-taking, such as violence (Karcher, 2002) and smoking (Karcher & Finn, 2005), as well as contributors to prosocial, positive youth development (Karcher & Lindwall, 2003). The Hemingway subscales measure positive connections to important adolescent worlds. There are four major worlds (composite scales) of connectedness as well as several related worlds (subscales). The four major worlds include connectedness to 1) school (school and teachers), 2) family (parents and siblings), 3) friends and romantic partners, and 4) self and are depicted in the figure above. 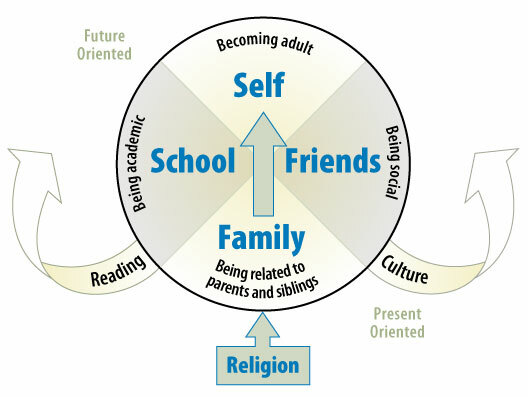 In the adolescent version, other connectedness subscales include peers, reading, “culturally different others,” religion, and neighborhood (not depicted above, this world falls within the friends world, primarily). Self-in-the-future relates to school, teachers, and reading (all on the left side), while self- in-the-present relates to culture, friends, and neighborhood (all towards the right side). The theoretical basis and empirical validation for these scales is described in the manual and more fully elsewhere (Karcher, 2000a).